Kate Boats Hire Base is a minor waterways place minor waterways place place on the waterways major waterways place village town city on the Grand Union Canal (Warwick and Napton Canal) between Napton Junction (Junction of Grand Union and Oxford Canals) (12 miles and 6¼ furlongs and 23 locks to the east) and Budbrooke Junction (Junction of Saltisford Arm and Grand Union Main Line) (1 mile and 2¾ furlongs and 2 locks to the west). The nearest place in the direction of Napton Junction is Guy&apos;s Cliffe Union Wharf; ½ furlongs away. The nearest place in the direction of Budbrooke Junction is Coventry Road Bridge No 49 (Warwick town centre half a mile due south); ½ furlongs away. 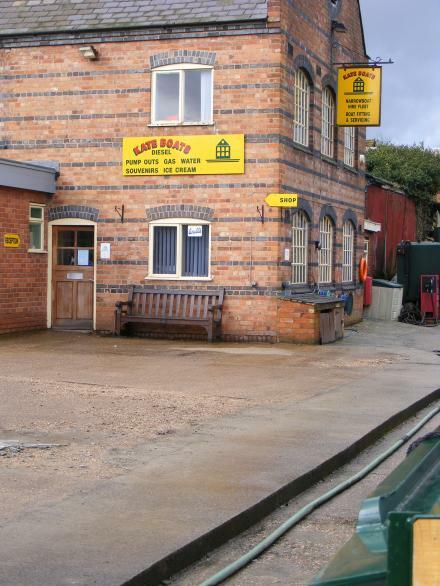 Facilities: diesel for sale, chemical toilet disposal, gas for sale, coal for sale, boatyard pump-out and water point. Kate Boats (Warwick) office, shop and wharf. Warwick — 1357 yards to the west. Coventry Rd, Warwick, CV345YN — 1277 yards to the north. 30 Market Place, Warwick, CV34 4SH — 1495 yards to the southwest. 4 The Holloway, Warwick, CV34 4SJ — 1506 yards to the southwest. 3-7 Market Place, Warwick, CV34 4SA — 1450 yards to the southwest. 33 St Johns, Warwick, CV34 4NE — 1535 yards to the southwest. 50 Brook St, Warwick, CV34 4BL — 1497 yards to the southwest. St Nicholas Park, Warwick, CV34 6LQ — 992 yards to the south. Bromson Hall Farm Stables, Warwick, CV35 9AB — 1039 yards to the southwest. Warwick — 1392 yards to the west. Warwick Sport, University of Warwick, Coventry, CV4 7AL — 1529 yards to the southwest. Warwick — 1417 yards to the southwest. Saltisford Office Park, Ansell Way, Warwick, CV34 4UL — 1440 yards to the southwest. Unit 4 Benford Court, Lower Cape, Warwick, CV34 5DA — 1378 yards to the west. Station Approach, Warwick, CV34 4LA — 651 yards to the southwest. 92 Coventry Rd, Warwick, CV34 5HH — 431 yards to the southwest. Leamington Spa — 595 yards to the west. Warwick — 1524 yards to the southwest. 3-7 Market Place, Warwick, CV344 — 1432 yards to the southwest. Myton Rd, Warwick, CV34 6LQ — 1594 yards to the south. 64 Market Place, Warwick, CV34 4SD — 1523 yards to the southwest. Unit 3, Just nice house, Miller's rd, Warwick, CV34 — 881 yards to the west. Warwick, CV34 — 1147 yards to the southwest. Warwick — 335 yards to the west. Warwick — 1309 yards to the east. 13 Jury Street, Warwick, CV344EH — 1344 yards to the southwest. 21 Church St, Warwick, CV34 4RA — 1332 yards to the southwest. The Collegiate Church of St Mary, Warwick, CV34 4RA — 1394 yards to the southwest. Warwick Castle, Warwick, CV34 4QU — 1483 yards to the southwest. 11 Church Street, Warwick, CV34 4AB — 1420 yards to the southwest. Bénin — 1469 yards to the southwest. Coventry Road, Warwick, CV34 5YD — 1202 yards to the north. Warwick — 1356 yards to the southwest. Various, Warwick, CV35 — 1529 yards to the southwest. Lakin Rd, Warwick, CV34 5 — 505 yards to the west. Warwick — 1337 yards to the west. The Boatyard, Nelson Lane, Warwick, CV34 5JB — 27 yards to the west. Warwick — 963 yards to the south. Warwick, CV34 5 — 1020 yards to the north. Warwick, CV34 — 1524 yards to the southwest. Myton Road, Leamington Spa — 1392 yards to the southeast. Jury Street, Warwick, CV34 4EW — 1317 yards to the southwest. 1 Wavytree Close, Warwick, CV34 4UA — 1562 yards to the southwest.